wendy house » Blog Archive » who’s on the train today? who’s on the train today? 1 person (other than me) who looked like a woman – where are the other women? 1 person (other than me) who looked over 45 years – where are the 50+ people? 1 person (other than me) wearing brightly coloured clothes – where are the people who adore wearing brightly coloured clothes? 1 person who looks under 18 years – where are the other children? On this train I was definitiely a ‘different’ passenger…. This scribble was published on Tuesday, February 28th, 2012. You can follow any banter on this scribble with the RSS 2.0 feed. You can share your inspired musings after typing the anti spam word near the bottom of the page. But no Pinging because its too naughty. Everyone looks so nice and quiet. The last time I was on a train in England, the loudest talking woman in the world came and sat next to me. Just my luck! 2. the only person not reading a Harry Potter novel. Btw, I am with Kay Guest as far as talking goes. 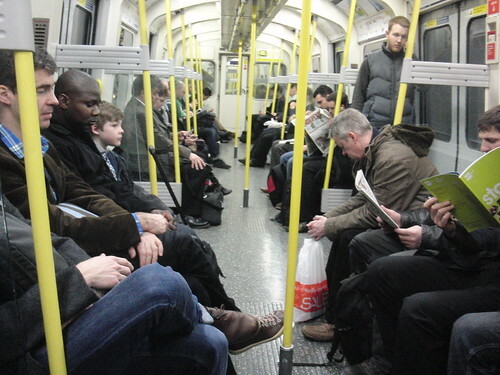 Library rules of silence should apply in Tube trains – all the better to consume JK Rowling. Mobile phones should be instantly confiscated. It is the only language their owners understand. that looks like a depressing bunch to share a train ride with, I bet you brightened things up though! Speaking of hats, mine is off to you for taking the picture. Although I take my camera absolutely everywhere with me, I usually feel too embarassed to take pictures in certain scenarios like the one above. The Tube is very fast and practical, but I hate going to the main hall to see when my train arrives! but my best friends keep moving to the UK!